There is nothing magical about training dogs. Good dog training is all common sense together with a foundation based on experience and understanding of the way dogs think and interact. Everyone is able to do it. But sometimes dog owners need an additional equipment to teach their dogs to obey. Herm Sprenger designers put a lot of effort to create such an equipment. 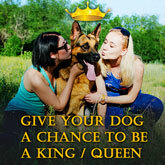 Many experienced dog trainers say that it is strongly recommended to use pinch collars in a process of training. Though some people think pinch collars look awful the fact is they are far more humane than an ordinary Choke Collar. 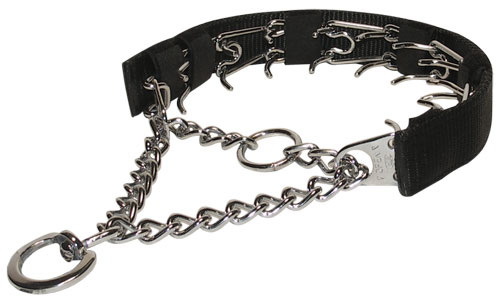 We bring to your attention Stainless Steel - Dog pinch collar (made in Germany). The most efficient training collar is this one. When used correctly, this collar can be very similar to mom's teeth to a puppy. Before using the pinch collar you should know that he thickness of the wire used in each and every link has to be chosen as big as possible and the blunt heads have to be rounded off very carefully in order to spare dog from any injuries of the skin. Separating any two links or using one of the other 'quick-release' style of pinch collars. Sprenger manufactures, open the collar like a necklace and place it around your dog's throat. For the obvious reason to prevent eye injury, the prong shouldn't be slipped over the dog's head. My order arrived last Friday and the collars are Superb we are very pleased will all of them, workmanship and appearance. We will definitely keep you at the top to our list the next time we need something. Gâ€™day Guy Just wanted to say a HUGE thank you for getting more order processed and shipped so quickly. It arrived today just in time for our weekend sessions. Iâ€™ll certainly being using your services again in the near future. Cheers Training Director 0400 440 526"